Did you know that 300 hours of video are uploaded to YouTube every minute? On average, there are 1,000 million video views per day. So how can you make your channel and videos get noticed? Go into YouTube Analytics and check your demographics, look where your traffic is coming from and what is the age and gender of your audience. Look at relevant Facebook groups and forums for questions related to your niche. Read the comments under your videos and on similar channels. Participate in live streams related to your channel niche. Enter your main keyword in Google and YouTube and get a bunch of suggestions of what people are typing into the search engines. 2. Brand your channel and videos. Think about the path that a typical viewer will take to find your videos and channel. The initial click begins with a great thumbnail. Click here to watch my video on how to create a clickable thumbnail using Canva. One of the best ways to brand your thumbnails is to include your face because there’s only one of you in the world. I’ve noticed that most of the traffic from my new videos comes from the channel home screen. Therefore, make sure your channel banner grabs the attention of your viewers within the first five seconds. Click here to watch my video on how to create a unique value proposition for your YouTube channel. Include a customized channel trailer on your channel home page that tells people why they should subscribe to your channel. Add sections to your channel home page that include playlists. When the branding on your channel home page is congruent, people would be more inclined to subscribe to your channel. Also, when people see your thumbnails throughout the net, they’d be able to associate your channel with that thumbnail. When you add videos to a playlist, they will inspire people to watch more of your videos. This increases the watch time on your YouTube channel which YouTube loves. The longer a person stays watching your video or successive videos, the more watch time you’ll receive. This will result in your YouTube videos appearing in search and YouTube suggested videos. 4. Research the correct keywords. People will discover your videos based upon the keywords they enter into the search engines. One way to find out what people are typing into the search engines is to type in your main keyword into Google or YouTube. For example, if I enter dog training into the YouTube suggestion box, I get a list of suggestions. Use these keyword phrases in your title, description, and tags if you want your videos to be discovered. A great keyword research tool that I use is called TubeBuddy. It will give you an indication of how competitive that keyword phrase is. If there are too many competitors, then it’s a waste of time going after that keyword phrase. 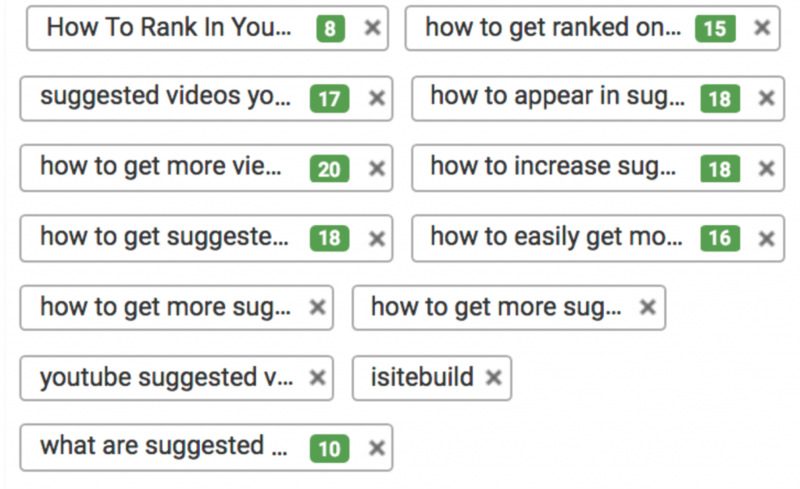 If it gets a high keyword score, use that keyword phrase in your title, description, and tags for your next video. YouTube will promote your videos on other people’s channels if it gets a long watch time. In order to get a long watch time on your video, you have to create an engaging video. Incorporate video footage to reset the attention of your viewers throughout the video. Use cards to redirect viewers to related videos and encourage interaction. Change positions while shooting the video. Edit out unnecessary filler content. Be natural, instead of reading off a script, just follow a set of bullet points and address the person on the other side of the camera as if you’re having a cup of coffee with them. After you’ve published a video, your work has just begun. Promote your videos on social media sites like Facebook, Instagram and LinkedIn. Usually I just click on the icons provided by YouTube under the video. Embed your video on your own website and related websites. Click here to watch my video on 10 ways to repurpose your video content. It’s a great way to expand your audience beyond YouTube and get more eyeballs on your videos. Do collaborations. Collaborations will expose your content to another audience besides your own. The more collaborations you do, the more audiences you’ll reach. 7. Track the performance of your video. Click on YouTube Analytics and look at the top 10 videos which are getting the most traffic. Click on traffic sources to see where most of your traffic is coming from. Click on the subscriber link to find out which videos are attracting the most subscribers. 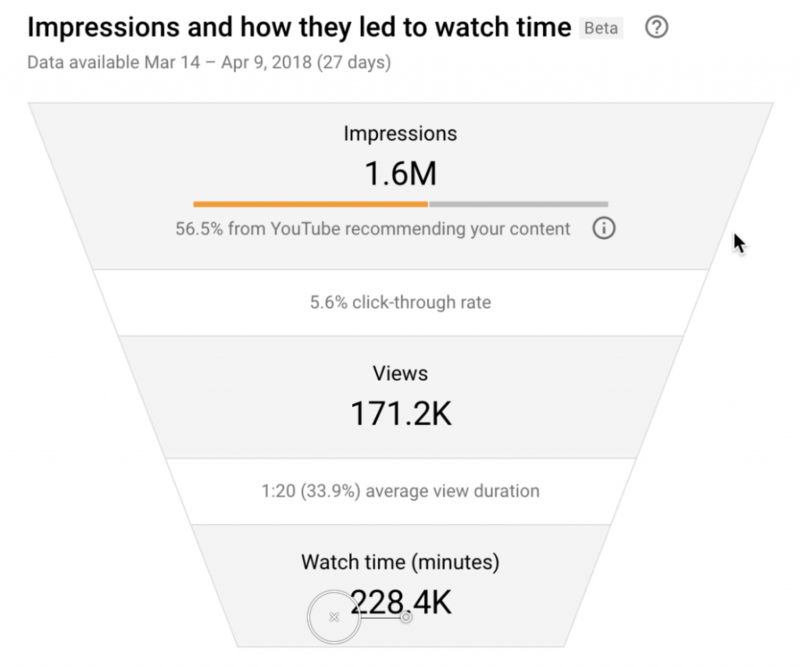 Now, you can view the new metrics funnel in YouTube Studio Beta, the funnel depicts how many times a thumbnail was shown to viewers on YouTube.com, impressions and how often viewers watch a video after seeing an impression, which is the click-through rate. 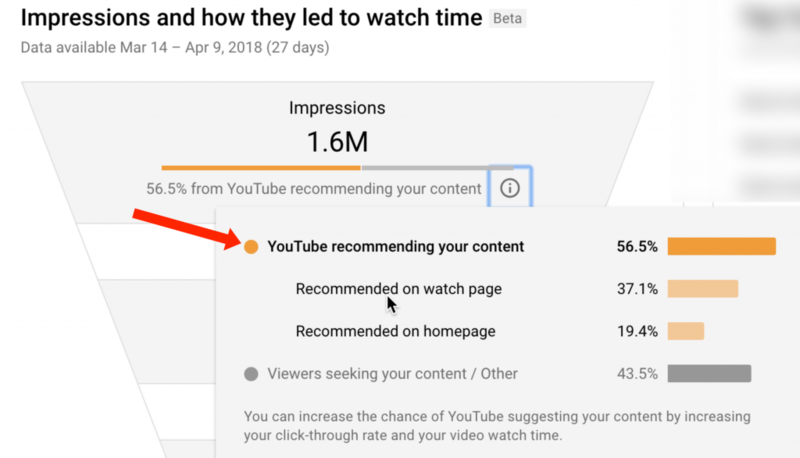 As you can see, YouTube is recommending my content 56.5% of the time, recommended on the watch page, 37.1%, and recommended on the home page, 19.4%. You can see the new metrics funnel by going to YouTube Studio Beta, click on Analytics, click Discovery. By studying the YouTube analytics, you can create more videos on similar topics or the ones that are performing the best. You can also use TubeBuddy to check the rankings of the keywords that you’ve used in your tags. If you see a number of green check marks, you know that your video has done very well on the search engines. Click here to learn how to rank your videos on YouTube search and suggested videos. You’ll learn how to get your videos discovered by people searching your keyword phrase on Google and YouTube. Create videos that your audience wants to watch. You can achieve this by offering solutions to their most burning questions. Make videos that you enjoy creating. If you don’t have an interest or passion for the video that you’re creating, it will show up in the video. YouTube is a marathon, not a sprint. Therefore, think long-term when growing your YouTube channel. Now you know 7 ways to stand out on YouTube.